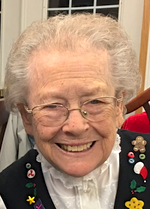 Peggy A. Elliott, age 83, of Gardner passed away June 20th at Overland Park Regional Hospital. Funeral Service will be 11:00 am Thursday, June 23, 2016 at New Life Community Church, 17935 Moonlight Rd, Gardner, KS, with burial following at Gardner Cemetery. Visitation will begin at 10:00 before the service at the church. In lieu of flowers, the family suggests memorials to the American Diabetes Foundation. Arrangements: Bruce Funeral Home, Gardner, 913-856-7111. Peggy was born June 17, 1933 in Fort Scott, KS. She was the daughter of Herman P. and Alice E. (Cowan) Ramsey. She lived with her family on farm near Uniontown, KS most of her childhood. She graduated from Uniontown High School. Later she graduated from Central Missouri State University and, still later from the University of Kansas, School of Law. Peggy married Frank E. Elliott May 20th, 1962. She was preceded in death by her parents; husband, Frank, in 2005. Survivors include: daughters, Janet L. Highfill and husband Jim “Spark” of Edgerton, KS, Jane L. Rankin of Shoreline, WA, son Jeff E. Elliott of Gardner, KS, and daughter in law Jennifer L. Elliott of Gardner, KS; ten grandchildren; eight great grandchildren; and a sister, Cathleen Prescott of Corona, CA. She taught elementary grades in schools in California, Kansas, and Missouri prior to entering law school. She subsequently was in private practice a short time and then worked in the Shawnee County, Kansas District Court Trustee’s office, and in the Johnson County, Kansas District Court Trustee’s office where Peggy was appointed the Court Trustee. She was active in the Topeka Civitan Club, the national, state, and local Child Support Enforcement organizations and in Olathe Children’s Initiatives.